GENERAL: The route of the thousand "vertical" meters is completed in a distance of 4,3 km on the famous "Goumarostali" path. COMPLIANCE: All athletes are required to fully respect the regulations described below. They are also obliged to obey the instructions of the race judges. Inability to comply with regulations or instructions leads to exclusion penalty. The race judges, when they notice violations of the regulations, record them and inform the offenders. Any other person authorized by the organizers has the ability to record any violation he or she becomes aware of, and submit it for examination to the Competition Committee. RIGHT TO PARTICIPATE: Men and women over the age of 18 (completed at the date of the race) are eligible to participate in the race. TIME LIMITS. There are no time limits. ATHLETE BIB NUMBER: Each athlete carries the bib number on a prominent point on the front of his/her shirt. The bib number must remain throughout the race without folding, thus not hiding any part of the number, athletes name, sponsors, logos, etc. The bib number, in addition to the participation number will also have the name of the athlete printed on it. Substantial alteration of the number, which may cause confusion to the recording officers of the Control Points, is punishable by exclusion. Loss of the number is punished by exclusion. The athletes of each event that finished in the immediately preceding years race, are numbered with their last year’s finish position. ROUTE MARKINGS: The markings of the route placed by the organizers is temporary, in order to aid the athletes, and after the race is removed. These are mainly mileage and directional signs, as well as deterrent signs to an improper route. 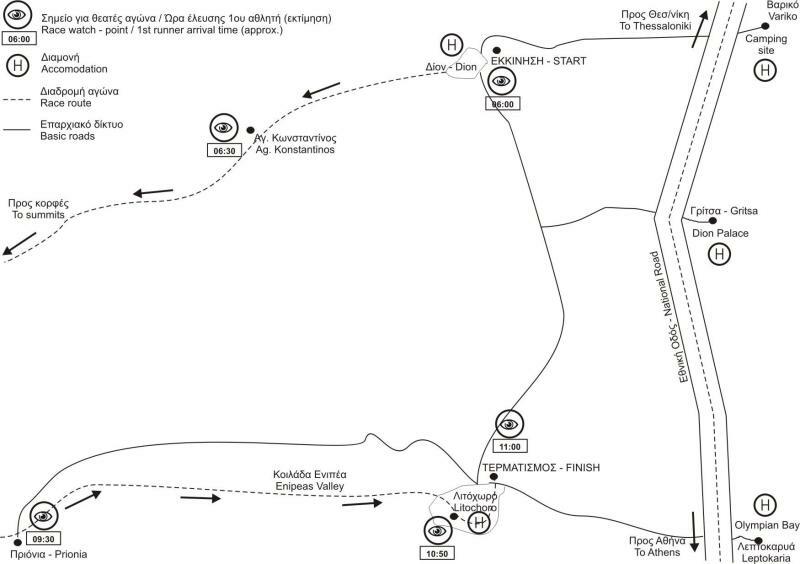 The fixed markings of the paths used by the race are sufficient, as well as the trail itself, so that there is no way of losing the correct course by the athletes. EXTERNAL HELP: External assistance to athletes by anyone is strictly forbidden. AUXILIARY EQUIPMENT: It is allowed the use walking poles. WASTE: It is strictly forbidden the disposal of all kinds of objects along the route, such as plastic bottles or any other solid or liquid food packaging materials (wrappings). At Start/Finish points there will be special plastic waste bag. Athletes are required to throw their waste into these bags. MOVEMENT ON THE TRAILS: Athletes are obliged to move on the path without forming teams that stretch in width, thus prohibiting other athletes to overtake them. In addition, off-road movement increases the risk of injury. Another serious reason is the destruction of rare endemic plants of the Olympus flora. When an athlete is notified that he should make aside to be overtaken, he should remain on the upstream side of the slope. Dogs that may accompany some athletes are prohibited. ROUTE SHORT CUTS: The short-cuts of the route are prohibited and are punishable by exclusion from the race. Each competitor has the responsibility and is required to carefully monitor the warning signals on specific sections of the path that indicate a prohibited cut / path. REFRESHMENT STATIONS: There are no refreshment station. PROTESTS: Protests for whatever reason can be made only by the athlete himself, within 30 minutes after finishing. The decision of the protest committee, composed by the Race Director, members of the Technical Committee and the Head Officer of the Control Point in the responsibility area of which the event was recorded, shall be issued no later than the time of the awards ceremony and will be final. SECURITY: The ORGANIZATION undertakes the monitoring of the race with specialized personnel on safety, rescue and medical assistance for athletes who might be in need. In cases where security staff and judges indicate to athletes that they need to change direction for safety reasons, athletes are obliged to obey. Denial of compliance means exclusion. RESULTS: The official (final) results of the race are published several days after the race, in order to undergo cross-checking of the data. Only after publication of the official results the certificates of participation are printed. PRIZES: Commemorative prizes are given to the first three men and to the first three women winners of the overall ranking. DISCLAIMER: The ORGANIZATION and the COMPETITION COMMITTEE are not responsible for the death, injury or any damage to the health of the competitors who, by submitting the application form, declare that they are aware of the dangers that exist in a mountainous environment and that their state of health is good and allows them to race, and they have recently been examined by a doctor for this issue. However, no athlete will be required to produce a medical certificate. Athletes themselves are required to regularly take medical precautions to check their health status. The ORGANIZATION/ COMPETITION COMMITTEE disclaims any responsibility for the physical integrity of athletes who are obliged to behave responsibly at points of the route where the risk of falling with unpleasant or fatal outcomes is increased. INSURANCE: The ORGANIZATION covers all participants by a Group Insurance Contract. COPYRIGHT: The ORGANIZATION maintains the exclusive copyright of the photographs and videos of the race by partners assigned to it. Any athlete, who submits the application form, automatically accepts this condition, knowing that his face may appear in photos or videos without permission and without claiming any compensation from any publication of the material. MODIFICATION OF REGULATIONS: Organizers reserve the right to amend the race regulations without prior notice.